In my day gig I’m a business analyst for a large hospital. A significant amount of my week is taken up with meetings, and obviously, I need to take notes during them. I also take notes for freelance articles and my research notes for my fiction writing. Additionally, I have little day-to-day notes where I may make a note of the RGB color values I might need, or the size screws I need to get at Home Depot. At the center of this workflow is my iPad and iPhone. Today, I’m going to tell you how I use OneNote, Evernote, and the built-in Notes app to take my notes. As with most of my document requirements, I want a cross-platform solution, or, at least something I can access on the web. My approach to taking notes is very simple. I want to be able to capture information accurately and be able easily flag a note as an action item. At this point, I’m not too worried about typos and correct grammar. I can go clean them up later. I also want to be able to store clippings and notes for when I’m working on my fiction. One of the stories I’m working on is set in Boston in the 1970s. So, I have a digital notebook about Chinatown, who the political leaders were, and notes from documentaries about the era. Lastly, there are a lot of little notes I take throughout the day. These notes may be a setting on a guitar effects pedal I want to try, parts I want to order, and a few network passwords (I know, those should be in OnePassword). By far, the best solution I’ve found for taking notes in work meetings is OneNote. Evernote is in second place, but it’s a distant gap between the two apps. I have one OneNote notebook (labeled with the name of the company I work for) and each project becomes a page in that notebook. When I got to a meeting, I bring my iPad with me, open up the page to that project and use the on-screen keyboard to take notes. Again, I’m more concerned with getting the information down accurately and only fix a typo if it will hinder my recollection of a fact. So, I’ll fix a typo about a field name, but not care if I got a person’s name wrong (unless, of course, I don’t already know how to spell his or her last name). Where OneNote succeeds for me is the ability to quickly track action items. If I make a note, I can just tap the To Do icon in the ribbon and OneNote puts a check box in front of the sentence. I’ll then add a sentence on who will follow up. At the next status meeting, I’ll scan the notes and check off completed action items. This is huge for me, since before I’d have to use some sort of shorthand to track an action item. I’d either start the sentence with three asterisks, highlight it, or some other workaround. I also have OneNote installed on my Mac so I can edit the notes on a larger screen if I need to. I can also access my notebooks on the OneDrive web site. Admittedly, I could use OneNote for a lot of my personal notes. I don’t for two reasons: I have years of research notes I’m in no mood to migrate; and I like having a clear separation of work notes and personal notes. This way, if someone asks to see my iPad to look over some notes, I don’t have to worry they may click on the wrong section and see a personal note. Also, a lot of my personal note taking is clipping a web page an appending some commentary to it. I find it easier to do this with Evernote. I frequently use the iOS extension to clip a page into my research notes. OneNote also has a clipper, but I haven’t needed to us it. I will try it when I need to clip a web page for work. Unlike OneNote, where I have one notebook for work, in Evernote I have a different notebook for each category. I have notebooks for workspaces I’ve admired, one for researching Apple articles, notebooks for video game references, and one for great long form writing I’ve clipped into Evernote. Lastly, I have a lot of incidental notes that don’t really belong in either Onenote or Evernote. These are the types of notes I might put in a small paper notebook or a post it note. Looking through my notes as I’m writing this I see notes for a Terminal command I need to enter to use a client gateway on my Mac, the site ID I need to use when I call in for support, some settings to try out on my Amp, and a few musical notes I need to reference during band practice. So, why aren’t these in the other two apps? Usually, they are a note I don’t want to get buried or have to worry about a sync error, and are usually just a line or two of text. At some point, I should go through and group some of them into Evernote, but it’s not a big enough of a deal. I don’t use my iPhone 6 Plus for note taking in meetings, but I’d like to. The main reason I don’t is perception. Typing on my iPad gives the impression I’m working. Typing on my iPhone gives the impression I’m texting. For now, while I’m at work the safer option is to just use my iPad. I have thought about getting a small, foldable, Bluetooth keyboard to use in these situations. Every now and then, I weigh whether keeping my notes split between OneNote and Evernote is a sound decision. A part of me wants to keep most of most of my notes in one place. I’m just not that thrilled with OneNote’s web clipper, though. I think the Evernote clipper does a better job of rendering the page. For now, though, I’m ok with the split as I feel it plays to each app’s strengths. Very good article. I use OneNote and my Notes app in the same manner. :) Thanks for introducing me to EverNote and OnePassword. You only use notebooks and pages in OneNote? Don’t you use sections and sections groups? I use the notes App on my iPad Air 2 it works well for all my to-dos. Thanks for letting us peek in on your procedure! As far as going to one app (OneNote or Evernote), I recently started working at a new company that had previously been a freelance client of mine. In Evernote (which I use much as you do, and have many notes I’d rather not have to migrate anywhere or get tangled up with work notes), I already had a Notebook for this company. What I did was create a new free Evernote account at work using my work email address, and then I shared that existing company notebook from my personal account with the new work account, so that I can see older notes as well as add new ones. This lets me keep everything in Evernote (including access to work Reminders, which I can access anywhere), and have all my work stuff available to me at work and at home, while keeping my personal stuff off the work computer. Naturally, when I’m at work and need personal Evernote info, I can always look on my iOS device or the web. So far it’s working great! I realize it might not be ideal for your situation, but wanted to mention it just in case as I’d been struggling with trying to find a single, streamlined solution. Though I have both OneNote and Evernote, I’ve always view these apps as a little more than “Note Repositories”. They are great for organizing your notes, but heck if you want to make good notes, then simple pen/pencil and paper is still the best option. Now saying this, I’m using an IPad app called NotesPlus (http://notesplusapp.com) along with a Adonit JotScript smart stylus ( http://www.adonit.net/jot/script/) and I resumed using a plastic matte screen protector for my iPad (To better simulate the feel of writing on paper) and it’s been fairly promising. Does anyone have any better suggestions to improve on this or better yet, is there a better app or stylus or any options besides that? I use Apple’s Notes for speed writing notes on the job, although occasionally a line or 2 will just disappear! Those notes always contains to do’s. Having read your article I will give MS OneNote a try, although the comments in the App Store say there’s a bug in the current version that causes significant CPU hit and battery drain in Mac OS, to be resolved in next iteration. 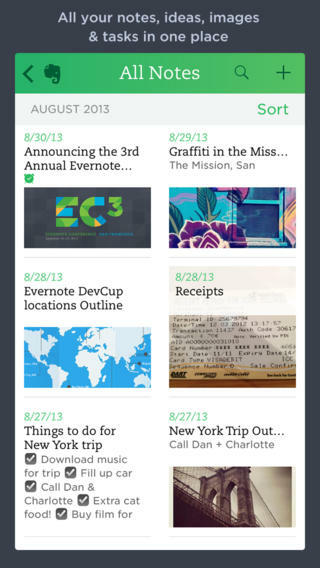 I never ‘got’ Evernote – clipping a webpage on iOS was such a pain, but now with extension support I will revisit. You can use another app like Good Notes, that lets you take notes in ink and typed as well. I agree in that OneNote should have inking capabilities (it has had them for over a decade in its original windows platform). I’ve found Mobile OCR very useful in grabbing quotes from books. Usually the clip gets pasted into an email back to me so the line breaks can be removed. Then it’s pasted into a Evernote folder. Very good article. I would also like to mention online note taking platforms like https://hackpad.com it makes sharing or privatizing very very easy. Think Docs from Google as a startup. I wish the OneNote app on my iPad would let you input handwritten notes. This is how I take notes in a meeting. This is the #1 wish from OneNote. Once they do this, I will never use Evernote again.